We’re putting the spotlight on Burgundy and the Jura with tips on what to do and where to go if you’re holidaying in the region. These are regions of outstanding natural beauty, and home to some of the best wine in France. If you’re holidaying at Camping Duinrell in Holland this summer, the obvious choice for a day trip is Amsterdam. Easily accessible from the campsite, either on Holland’s super-efficient bus and train network, or by car (though we’d suggest park and ride rather than driving into the city), there’s loads to see and do. While it would be impossible to cram everything in to one day, it is possible to see a lot as the city centre is fairly compact. Can’t get through your day without hearing the constant beep of a social media notification? Time to switch off! Discover 10 peaceful campsites where even the most digitally addicted won’t mind parting with their gadgets for a day or two. Camping Bella Austria is a glorious sanctuary if you are literally looking to head for the hills. But if you’re curious about what else Austria has to offer, here’s our top 10 reasons to visit. With a dynamic landscape that boasts majestic mountains, luscious forests and crystal-clear lakes, Austria offers a natural playground for adventurers and explorers. Trails for hiking or biking are in abundance, while you can take part in some forest climbing at Gröbming Adventure Park, Styria. Avoid the hustle and bustle of city life and soak up the scenery on a lakes and mountains holiday. Enjoy walking, cycling, swimming or any type of water-based activity you can think of – a visit to the lakes or mountains can be as hectic or laid-back as you want it to be. Discover beautiful alpine country and glorious shimmering lakes, where the climate is perfect during the summer months. Spanish cuisine isn’t quite as foreign as it once seemed. Nowadays a lot of British High Streets and shopping centres have a Spanish restaurant where you can indulge in the delicious food, although it can definitely be argued that Spanish food tastes better when sat under glorious sunshine, with a view of a beach and with a large jug of Sangria to help wash it down. Traditionally in Spain, Tapas is served before the first course, more often than not with a glass of wine. Tapas means ‘cover’ or ‘lid’ and it’s said to have originated from a piece of bread being used as a cover to keep flies out of the wine – clever thinking! Canvas Holidays’ sales consultant Nicki Ferguson has enjoyed seeing most of the world throughout her career in travel. For pleasure, however, it’s Nautic Almata in Rosas, Spain, she loves returning to. Here, she shares why this beach-based campsite holds such an enduring appeal for all her family. What is it about Nautic Almata that appeals to you? 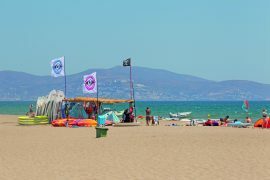 The campsite is laid back and very relaxed with direct access to a fabulous long sandy beach that runs for miles around the Bay of Roses. The location of the site is fantastic for exploring the Catalan region – from Figueres and down to Barcelona. There are lots of water sports available and a full animation and entertainment programme. We normally prefer smaller campsites but Nautic Almata has such a relaxed atmosphere, plus many of the people who stay there are repeat customers. We’ve visited the site four times.